Ian Creary, AMG’s Sales and Technical Support Manager, explains that a Multi-Service Ethernet Switch (MSES) is a hybrid technology that combines layer 2 managed Ethernet switch functionality with fully integrated data and contacts communication. “Multi-service Ethernet Switches allow for a variety of networking technologies to be integrated into the same environment, in the one box,” he says. “As well as Layer 2 Managed Ethernet functionality, AMG’s MSES supports the integration of low-speed and high-speed inputs and outputs, allowing serial ports and alarm contacts to be directly connected to the switch. Optimised for security applications, AMG’s MSES supports low and high-speed data, RS232 and RS485, FTT-10, I/O, alarm contacts, and audio. 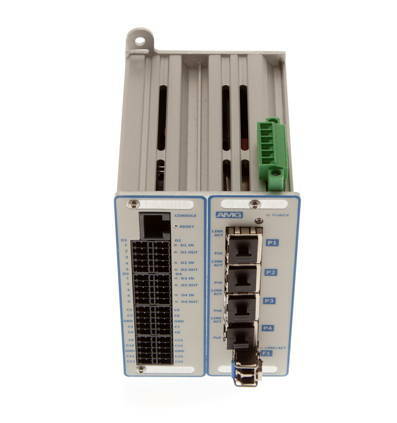 Serial ports and alarm I/O can be configured as either point-to-point and point-to-multipoint circuits, or as virtual circuits when interfaced with management systems. Multicast traffic is common on IP CCTV network deployments, and to ensure the switch can deal with this volume it is equipped with IGMP functionality and ring healing protocols. Ian Creary says that the added benefit of AMG’s Multi-Service Ethernet Switch is its design, ruggedized for use in extremely challenging environments, allowing it to operate in temperatures from as low as -40 deg C to as high as a blistering 75 deg C.